This recipe, although light and Springy, is very flavorful and satisfying. We have adapted this recipe from paleoleap.com to meet your Genesis Health Solutions program requirements. While this recipe serves four, it can be easily cut in half for two servings. Keep in mind, however, not to exceed your protein needs, as the size of the fish fillets can vary. You can actually eat 4 oz. of the cod, as it isn’t as dense of a protein source, and 4 oz. will provide the amount of protein needed for your meal. I often buy my cod fish at Sam’s Club. It doesn’t contain any STPP and is wild-caught. It also comes with several fillets in a bag and a lower price per serving. With ½ a serving of vegetable in the recipe, add another ½ cup of cooked or 1 cup of raw to complete your requirements. A serving of fat is already included. Heat 2 Tbsp. oil in a skillet over medium heat. Add the garlic, onion and red pepper flakes, cooking 3 minutes. Add tomatoes and cook 2-3 minutes more. Pour in the chicken broth, bringing to a light boil, then stir in the basil, lemon juice, zest, salt and pepper. Simmering on low heat, cook 8-10 minutes. In another skillet, heat 2 Tbsp. oil to medium heat. Add cod fillets seasoned with sea salt & pepper and cook 4-5 minutes per side or until cooked through. 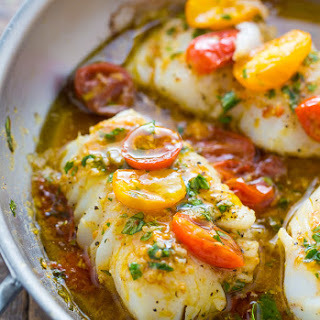 Serve the cod topped with the tomato-basil relish. Enjoy!